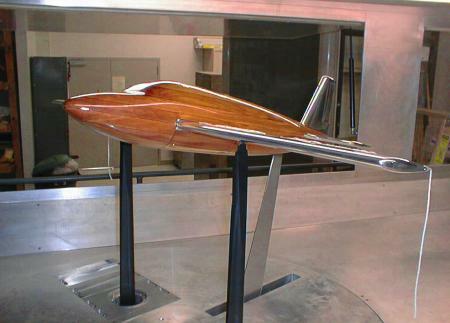 UC Davis Aeronautical Wind Tunnel (AWT) is used for both university affiliated research. 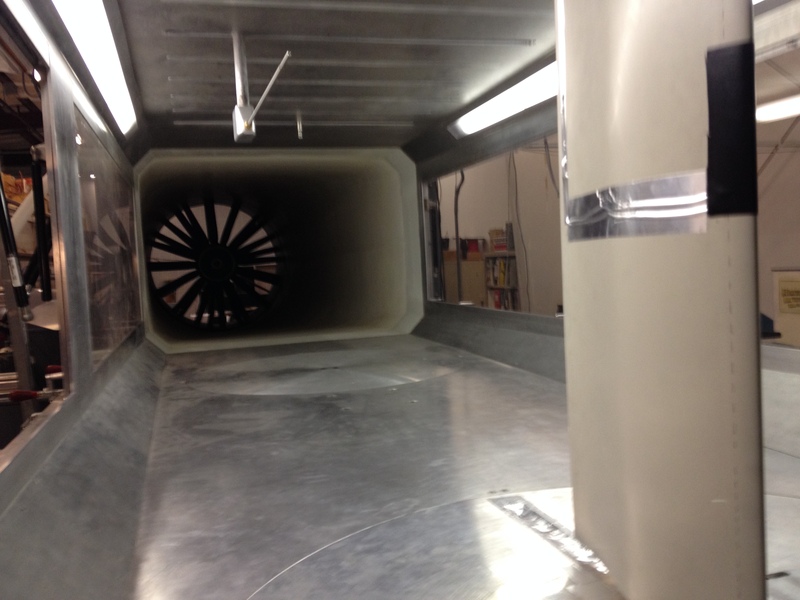 The AWT is an open circuit tunnel with a 33.6″ x 48″ closed test section. A 125 horsepower motor produces a maximum velocity of 165 mph through the test section. Turbulence levels have been determined to be < 0.1% throughout the velocity range. A pyramidal balance measures all six force and moment components over a wide range of angle of attack and angle of yaw. An aluminum honeycomb 6″ deep with .25″ cells (aspect ratio of 24) is located in the welded steel entrance chamber, protected by a coarse screen at the inlet. The honeycomb is followed by four 20 x 20 mesh (.009″ dia.) stainless steel anti-turbulence screens. Space is left for one additional screen. The section is composed of four sides of identical curvature to provide equal pressures on adjoining sides at the corners to guard against the formation of corner vortices. The coordinates of the contraction is derived from a ninth-order polynomial with three derivatives equated to zero at the entrance and five at the exit providing extremely gradual transition from and to axial flow. Two 36″ turntables in the floor. The test section is constructed with parallel sides instead of the usual practice of diverging two sides to allow for boundary layer growth. 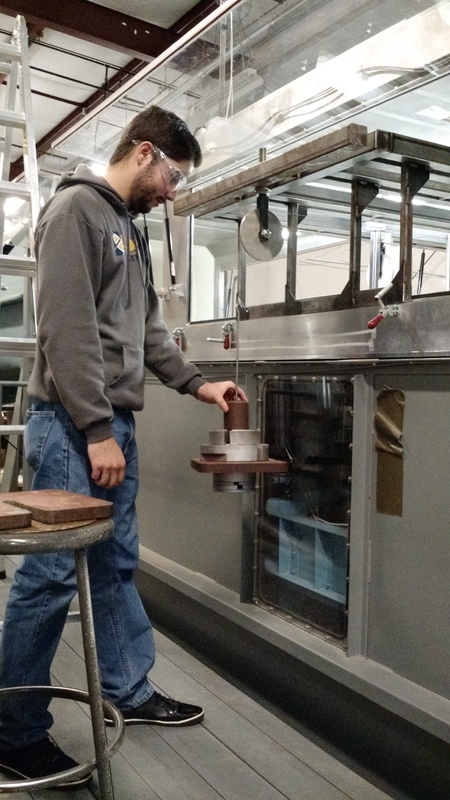 Four tapered fillets are installed in the test section to compensate for the narrowing of the flow channel due to boundary layer growth and to provide a constant static pressure throughout the test section. Aluminum floor and ceiling. Side walls are clear plexiglass panels hinged at the top to provide four 64″ wide doors centered on each of the two turntables. The doors can be removed and replaced with special glass doors as necessary. An 18″ ultraviolet light (F18T8-BLB) installed in one of the lower fillet panels can illuminate the upstream turntable for fluorescent visualization applications. Illumination is provided by two 96″ fluorescent tubes (F96T8-SSCW) installed in the upper fillet panels. Model positioning is performed by three Size 34 Slo-Syn stepper motors by the Superior Electric division of Warner Electric. 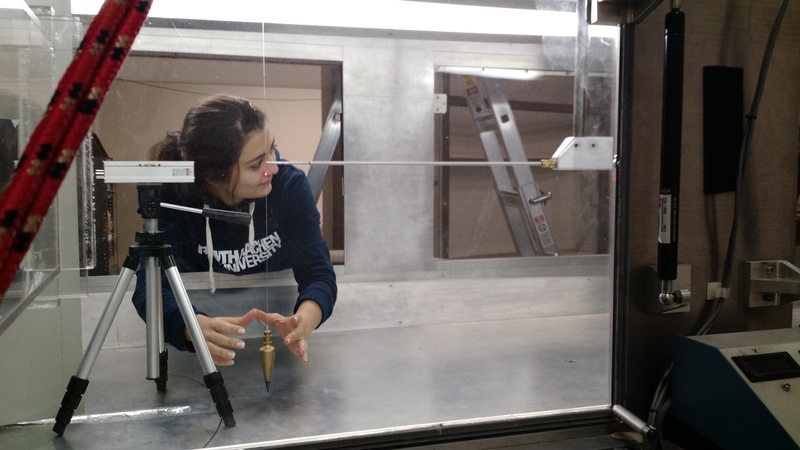 A two dimensional traversing mechanism installed from the ceiling of the test section is capable of moving a probe (e.g., hot wire, pitot tube) within a plane normal to the air flow. The traversing system can be manually placed at various longitudinal stations in the test section. – The drive is designated MT-A140E-110K-02UL and is designed for 216 amp variable torque. – 1000:1 speed-ratio capability and can hold the fan speed constant with a maximum variation of ±0.2%. A trash screen of 0.5″ mesh stainless steel is installed at the end of the diffuser to protect the fan. 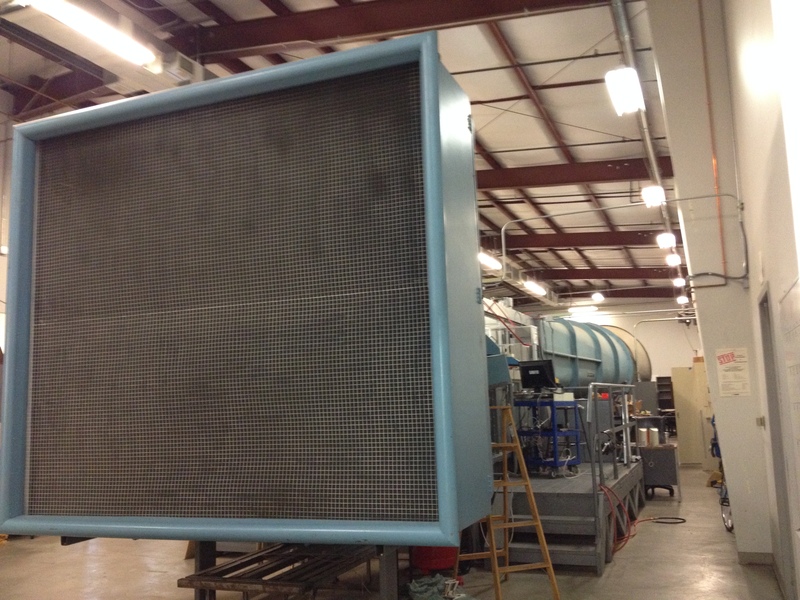 Noise Suppression: Sound absorbing diffuser is installed downstream of the fan. The central fan is streamlined with a sound absorbent tail section supported by radial struts.